Where the #%*! are my Pictures? Video Review: Guide to Assett Management – Where the #%*! are my Pictures? If you are into photography and have never visited the Luminous Landscape web site then shame on you. Do so immediately; it’s just about THE best resource for almost anything photographic and there will be something of interest to just about every photographer no matter what format you use. It’s run by the Toronto based photographer and photo journalist Michael Reichmann, a veteran of over 40 years within the industry. However, he is not the sole contributor, far from it in fact, and you will find articles from many other well know photographers and industry related personnel too. It’s not just the equipment reviews, tutorials and photographic tips that make this site rather good, but rather uniquely, it also provides downloadable video journals and tutorials, and it’s one of the latter that I want to talk about today. Ah! I here you mutter, other sites have downloadable video tutorials too…not like this they don’t! Michael is one of those photographers who is ‘in the know’, an A-lister if you like, and a member of that fraternity of photographers that has access to not only to the boys at Adobe, but is well enough respected by the industry to get to do hands on reviews of the latest equipment releases typically long before it’s let loose on the general public. His tutorials are not some 3-5 minute clips either, but generally comprise a whole DVD’s worth, set out in several chapters. The videos are hi-res downloads (1080 x 720) and are typically co-hosted, in many cases with Jeff Schewe, but in this particular tutorial Michael teams up with fellow photographer and DAM guru, Seth Resnick a Florida based photographer. So what is Where the #%*! are my Pictures?, and why should it be of any importance to you? Well it’s a tutorial of Digital Asset Management (DAM) and if you shoot digital and have amassed great quantities of digital images that now litter your hard drive (or hard drives! ), then this should be of interest to you. I consider myself to be pretty well tuned up to DAM. I’ve researched it on the net, read books on it (The DAM Book by Peter Krogh is a fine example) and have used Adobe Lightroom since it’s inception to manage and keyword my image library, which includes not only digital images, but slide, negative and photo scans. So would I learn any thing new? First of all, like most of the videos on the Luminous Lightroom, this is a large download, consisting of 2.9 GB in 9 files, comprising 11 video sections, each in 1080 x 720 resolution. The program starts with an introduction to the concept of Digital Asset Management and stating why you may need this even if you think you don’t. 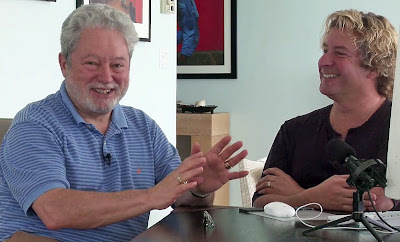 The format takes the form of a general but light hearted discussion between Michael Reichmann and Seth Resnick, with Seth presenting his strategies and Michael asking the questions a typical user would ask, and prompting for clarification where he thinks necessary. The whole program is focused on Digital Asset Management within Adobe Lightroom, but don’t let this put you off even if that is not your preferred choice software, as many, if not most of the methodology is applicable in many other scenarios. The tutorials are well presented and even entertaining, and Seth comes across as been quite obsessive (he uses another word) particularly about his key wording and back-up regimes. There are sequences on file organisation, importing and naming conventions, editing selection and ranking, captions, key-wording, and filtering with metadata. He then goes on to explain how to take a remote catalog on the road and yet still be able to work with all of your files, and then covers XMP sidecar files and the DNG option, before finishing up with archiving and backup. There is a lot of stuff covered here and while you may not particularly agree with, like or even need all of the detail and degree into which Seth goes for your own particular photo library, there is some here for everyone and I can almost guarantee it will change the way you manage your photographs. I was quite surprised by this video. I didn’t buy this for quite some while after it was available, as I thought I had DAM pretty much sown up and that I didn’t need this. I was wrong. I got much more out of this that I thought possible. If you’re a Lightroom user then this will be of particular appeal. It is informative, entertaining and enjoyable. 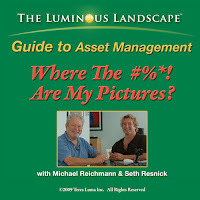 Guide to Asset Management – Where the #%*! are my Pictures? is available as a $29.95 download from the Luminous Landscape website store. Now if any tutorials turn up with Michael, Seth and Jeff Schewe all together, I’d buy it no matter what, just for the entertainment value, now that would be a prospect! By the way, I’ve acquired all Michael’s video journals. If a number of you are interested in a particular journal, send me a request and I’ll consider a review.